MODERN-day fairytales can come true, as one Aussie girl next door turned royal has proven. Channel 10's new telemovie charts the romance of Tasmanian native Mary Donaldson and Denmark's dashing Crown Prince Frederik. Mary: The Making of a Princess dramatises the budding romance of Mary and "Fred" after their chance meeting at a Sydney pub during the 2000 Olympics. Now the Crown Princess of Denmark and a mother of four, Mary is one of the country's most loved royals. "It's an improbable love story to meet someone in a pub and click with them on a random night out and then discover they live on the other side of the planet," Emma Hamilton, who plays Mary, told APN. "And then to discover he's part of the oldest monarchy in Europe and is going to inherit the crown, that's enough to throw water on any kind of romance. "Obviously they love each other very deeply and they fought to make it happen." Best known for her role in the period drama The Tudors, Hamilton rushed from the set of Mr Selfridge in London to film the TV movie. "It was an absolute dream to come home and play this role," she said. "I was shooting in (a drama set in) 1928 in London on the Friday, then flew to Sydney and we started shooting on the Tuesday. Suddenly I was in the year 2000 in Bondi; it was quite a roller coaster." But she'd been laying the groundwork for her chemistry with her co-star Ryan O'Kane for months beforehand. The actors wrote letters to each other between London and O'Kane's native New Zealand, giving them a taste of Frederik and Mary's long-distance courtship. "We really hit it off at our chemistry reading but we didn't know each other very well," Hamilton said. "We decided if we were going to do this then we'd do it the old fashioned way and write letters. It just makes getting the reply that much more special. "There's a certain thrill you get when a letter comes through the letter box and you see the postage stamp. It was a great way to get to know someone." Hamilton hasn't met Princess Mary but she spent weeks studying up on her life during the four years between her first meeting with Frederik and their marriage in Copenhagen in 2004. As the telemovie portrays, it wasn't smooth sailing as Mary navigated a new culture, language and the pressures of the tabloid press. "When you're playing a real person and someone who's still alive and a beloved public figure, you want to approach it with respect," she said. "I watched a lot of documentaries, media footage, I listened to tapes and read whatever I could get my hands on. "I didn't want to do a caricature or impersonation. I wanted it to be an interpretation." Renee Smalls and Gig Clarke also star as Mary's Sydney housemates and Gareth Reeves plays Prince Frederik's brother Joachim. 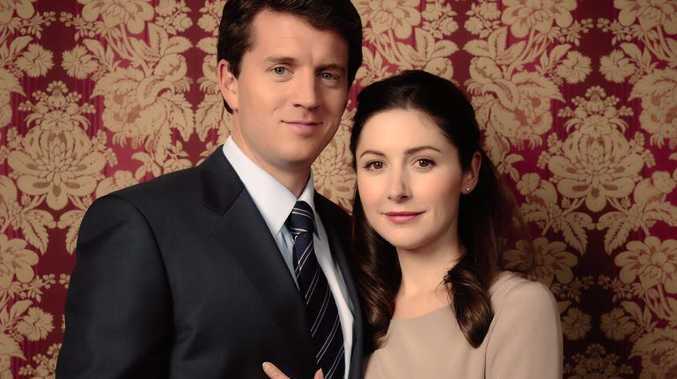 Mary: The Making of a Princess airs tonight at 8.30pm on Channel 10.